I went to Holy Confession to Father Bob at St. Matha's Catholic Church.. Father Bob laid his hands on my head at the end of my confession and gave me absolution. The next day I was at St. Michael praying the Chaplet of Divine Mercy in front of the Crucifix and studying the five wounds as I prayed. As I studied His hands nailed to the cross and what He must have suffered I heard our Lord say to me, "Those are the hands that absolved you of your sins yesterday." It is Christ, through the Priest that lays His hands and absolves you of your sins, how do you think you can 'hide' your sin? Isn't this mocking God and the confessional? 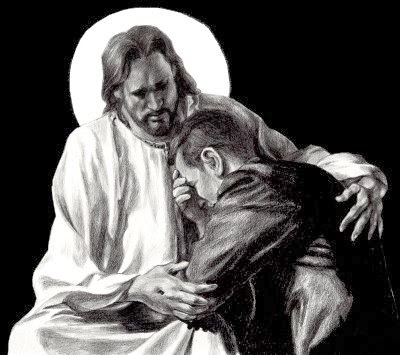 Jesus knows your heart, He knows what you did, but only you can begin the healing of that sin by SPEAKING IT with a repentant heart in the confessional. Hidden confessions in the heart are most likely to hide vile sins and to block true repentance, because when you SPEAK IT, you release it and it cannot be hidden in the heart. You have free will, God will not make you confess your sins, but if you truly want heaven, you must confess your sins, ALL of them, no matter how vile. The Priest's desire is the same as our Lord's, that you be put back on the path to Him, not to judge you here, he knows that we shall all face our own judgement in due time. I tell you the truth, if we walk into the confessional to use it as a temporary 'cleansing' with no intention to amend our lives of the most vile sins then we are playing into the hands of the devil. The demon takes the greatest delight in those that hide sins for fear of what the Priest might think of them. When we seek Holy Confession we are driving the demon out of our lives and he knows it. The confessional is the constant reminder to the evil one of where he shall be for all eternity, for if he is present with a soul at the time of that souls absolution the pain the demon endures during absolution is like the lake of fire he will know for eternity. This is why it is also like a 'mini' exorcism, for this is too painful for the demon to endure and he must flee. Let us say you are my friend, I love you, but I come up to you and slap you in the face. You are hurt, but I say, "I'm sorry." and you forgive me. After all is forgiven, I slap you again in the face. But I say I love you and ask your forgiveness. You forgive me. For the third time I slap you all the while while I say I love you. A fourth and a fifth till a hundred times I slap you, but ask for your love and forgiveness. Obviously, I have no intention of amending my behavior, but I most surely desire your forgiveness and your love, not only desire it, but EXPECT IT. If we do not change our behavior, although God still loves us, we do not truly love Him. God is not required to forgive you and give you heaven, it is because of His love and justice that He has loved us and seeks our repentance. This is why Confession is a "GIFT". Don't be afraid of the Confessional. Ask God to show you where you have sinned and what you need to confess. Ask Him to open your mind and your heart to make a true and pure confession. Tell Jesus everything you did through His Priest, and seek to change your lives. We think this is so hard, but again we have such help in the Holy Mass and the Holy Rosary. Go to Holy Mass everyday and you will fear sin greatly. Confession is the antidote to sin. It is a great gift, as you say, one that few people use - but for those that do - they are very happy for this wonderful gift from God.